I started blogging way back because of an epiphany handed to me by an employee of Foster's Group. That concept was the Johari window, and without rehashing too much, the Johari window has four panes. Things known to the self but not to others, things known to the self and to others, things unknown to both self and others and most relevantly things unknown to the self but known to others. This last pane is referred to as our blindspot. It is where we are all most vulnerable. Crucially its contents are almost impossible to perceive ourselves, it is literally a blind spot of self knowledge. It exists though, I am convinced. By second order thinking at least. How to tap into it? It's tricky, what you need to do is actually listen and entertain that what is being said about you may be truer than what you believe about yourself. In the above case of divergent tales of shoplifters, you could attack and deny that this is about race. Firstly you could suspect selection bias is going on. Somebody has taken a particularly bad case of injustice involving an African American woman, and then taken a particularly bad case of injustice (in the opposite direction) involving a white woman and created a quite extreme contrast. 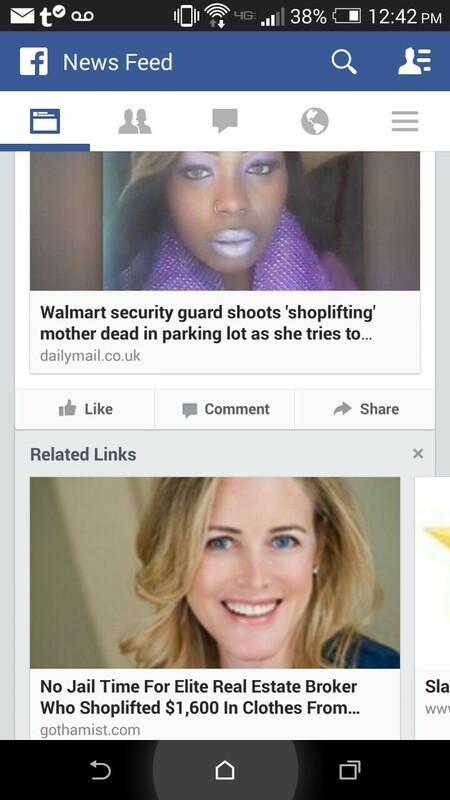 So you just google 'white woman shot for shoplifting' and look for all the ignored cases where a white woman has been gunned down after an initial suspicion of shoplifting. And you get nothing. Well you get a parody piece about Winona Ryder getting shot in an alternative universe LA. But it didn't happen, it never happens. You could then argue it's a class divide not a race divide. Not a good argument because you are saying that stealing tens of dollars worth of Wal Mart merchandise is apparently mandate for being executed in front of your children where $1,600 is an appearance in court for a reprimand and (probably) a fine. But again, you'd expect Wal Mart customers to get shot more often, and you would expect that a white woman would have been shot by a mall cop in that case. Australia is like 90% white, and catching the 109 tram along it's junkie stretch exposes one to plenty of mighty hostile white women. I know they exist, I know they have altercations with police, I know they generally only get shot when they charge an officer with a knife. Do you see what I'm doing though? I'm raising those arguments against an unpleasant truth as Freud said was done so easily and dismissing them. As if they have to be argued. And they kind of do, because it's very unpleasant to admit that you are a part of institutionalised racism. Because I suspect, it doesn't feel like you are. This off duty cop moonlighting as Wal Mart security was performing his job, a woman was suspected of shoplifting so he chased her down in his car. They had an altercation that was presumably hostile enough (in the manners sense) to escalate. And he pulled out his gun and shot the lady. To him I would guess (and being charitable) having never identified as racist, this seemed like an isolated incident where the victim happened to be black. The legal system is protecting these officers, because they need for some reason to protect the ability to kill African Americans so that officers can carry out their jobs. So that officers will continue to work. It seems nobody in authority can come out and say 'Coast to coast it is absolutely unacceptable that any citizen be killed as the result of a verbal altercation over a suspected minor misdemeanor. Or a verbal altercation period.' You could say this, because it's true. This would then force the police that really care about getting a pass for doing this to take up a position that would quickly and transparently be overtly racist. This, thusly, is my only tip, and probably the only real thing you can take away from it. We are what we do. Not what we think. If things look bad, it's because they are. The tricky thing is, that if what you are being told contradicts your subjective reality, you need to realise that you are living in everyone else's subjective reality too. And that might give you a picture of what objective reality actually is.